This article is based on a presentation given by OSHA’s Mary Bauer at the Precision Metalforming Association’s Pressroom Safety Seminar, held last September in Eagan, MN. Bauer has spent the last 21 years as a compliance officer and compliance assistance specialist with OSHA in Eau Claire, WI. This radio-controlled cart transports blanks and automatically loads them onto a transfer press. Such a material-handling arrangement eliminates the need for workers to transport them in a potentially unsafe manner. • Help prevent musculoskeletal disorders. Benefits to employers enacting and following through on an ergonomics plan include lower workers’ compensation costs, decreased defective parts and improved productivity. Improved employee morale is another advantage, leading to reduced employee injuries, less turnover and reduced absenteeism. Employees should be involved as well as management, as workers often have the best feel for individual job hazards and risks, and good methods for reducing those. And involving workers from the start will make them more receptive to changes resulting from the plan. Employee participation can mean inclusion on safety committees, informal conversation, questionnaires and symptom surveys. The best ergonomics plan would include production workers and lead personnel, tool and die makers and designers, maintenance and engineering departments, sales and bidding personnel, and the purchasing department. 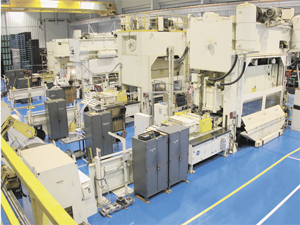 Typical pressroom tasks are rife with ergonomic issues stemming from tasks including die setting, transporting parts, processing parts, handling scrap, general cleaning and maintaining equipment. Such tasks lend themselves to ergonomic risk factors such as forceful exertion, repetitive movement, static or confined posture, non-neutral posture, over-shoulder work, heavy lifting and vibration. Stamping-press operators in particular are open to injury. 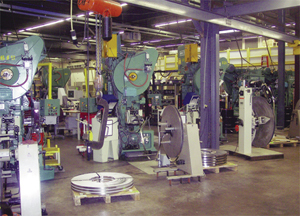 They bend, reach or stretch to load or unload parts and blanks, often performing these tasks several hours each day. All of that takes a toll, but simple redesigning of the tasks or work area can alleviate these ergonomic risks. For example, where press operators have to bend to pick up material, tools or parts, adjustable seats can be added, or materials raised off the floor to waist height and closer to the operator. Other methods to combat ergonomic problems involve engineering controls to eliminate or minimize hazards, use of different tools and improved tool maintenance. Other solutions include employee rotation among tasks, rest breaks, and in some cases, personal protective equipment such as gloves or back belts. Automation in many cases can eliminate ergonomic hazards. Such automation includes part-feeding equipment, robotics, part ejectors, conveyors, automatic lubrication systems, and slug- and scrap-removal systems. This pressroom utilizes under-floor scrap removal, resulting in a clean and safe manufacturing floor where workers need not handle or transport scrap. Other methods provide body relief over prolonged periods, including the use of chairs, or installing antifatigue mats where prolonged standing is required. Other equipment employed to ease ergonomic burdens include push/pull die carts and powered pallet jacks. 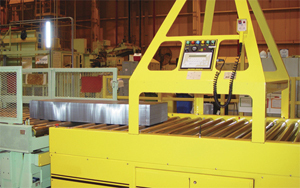 To load dies, and move to and from storage, employ hoists, roller conveyors and mechanized carts. Material-movement risks also can be averted via use of vacuum lifters and manipulators. A number of tasks place employees at physical risk. Such tasks result in awkward posture, high hand force related to pinching or gripping, highly repetitive motion and repeated impact. What movements or postures have been determined to be risky? • Kneeling for more than 4 hr. total per day. 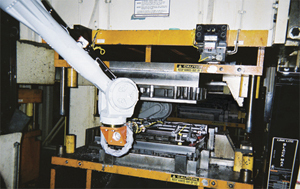 The use of cranes or hoists (top) can help alleviate pressroom ergonomic risks. • Gripping (using palms) an unsupported object weighing 10 lb. or more per hand, or gripping with a force of 10 lb. or more (similar to clamping automotive jumper cables onto a battery) for more than 4 hr. total per day—if gripping is highly repetitive or involves twisting, more than 3 hr. total per day. • Repeated impact using the hand or a knee as a hammer. A press-tending robot works quickly and efficiently while eliminating an ergonomic risk—workers need not bend or twist to grab parts or blanks. Educate and involve employees. Employees are the real experts when it comes to their jobs, and often are the best source for pointing out problems and possible solutions. Educating employees on ergonomics helps them to offer more meaningful suggestions and feel that they are a part of the solution. Examine all available data to find problems. Use workers’ compensation claims data, OSHA 300 logs, safety committee meetings, absenteeism and turnover records, employee suggestions and any other data available to identify where the biggest problems are. Follow up by observing tasks and talking to employees and supervisors about specific ergonomic problems. Encourage early reporting of problems. When employees feel comfortable about coming forward with symptoms of injury early on, the employer has an opportunity to take care of the problem before it results in a workers’ compensation claim. The net result is less pain and suffering for the employee and considerable cost savings for the employer. Find quick fixes to get momentum going. Don’t get caught up in “analysis paralysis.” Sometimes simple solutions can be implemented quickly with little analysis, such as raising a computer or lowering a countertop. Some problems are more complex than others. For some work-environment problems, a careful analysis is in order. Keep options open at this stage, as alternative solutions to the problem can be found that would have been missed without proper analysis. Focus on eliminating risk factors. Too often, businesses focus only on solutions like training employees and rotating them in and out of hazardous jobs as a fix. Of course, training in proper work practices is an important part of ergonomics and should accompany any new equipment or procedures. But changes to work practices and equipment often can eliminate or substantially reduce the risk factors for injury. Don’t just throw money and equipment at the problem. Purchasing equipment, such as a hoist, is often a good solution to an ergonomics problem. However, changing the something is done rather than replacing equipment often is the most effective to prevent injury. Make ergonomics part of purchasing and planning. Equipment expense could translate to reduced costs by taking advantage of opportunities to make equipment changes with an eye toward ergonomics during the planning stage. Any equipment with an obvious problem should be replaced quickly with something designed to eliminate or reduce the problem. Then, make sure that any worn out equipment is replaced with ergonomically designed equipment, where appropriate. Expect results, but be patient. Ergonomics tools and practices keep workers healthy and increase productivity, quality and employee morale. However, don’t be discouraged if these results are not immediate. Consider all of the benefits when calculating the return, not just reduced claims costs. For more information on ergonomic risks and tips for a safer workplace, visit www.osha.gov and click on the Ergonomics link. To see how OSHA is working with the Precision Metalforming Association to foster a safer workplace, visit www.pma.org and click on PMA/OSHA Alliance. There you can find the PMA Ergonomics Checklist that can be used to identify safety issues in your plant.